White gold sparkles and shines in these pretty lever-back love knot earrings in 14K white gold from Apples of Gold Jewelry! Lovingly crafted in 14K white gold, these beautiful earrings feature a fashionable lever back design that allows them to stay securely in place during wear. The white gold love knots are a smooth and simple design, and measure 13mm by 8mm each in size. These are a wonderful gift idea for a loved one, and are sure to brighten up her day. 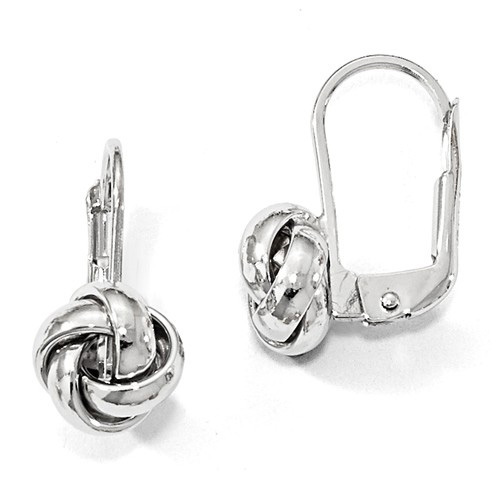 We guarantee our Lever-Back Love Knot Earrings, 14K White Gold to be high quality, authentic jewelry, as described above.